Each kidney is composed of over one million functioning cells called—nephrons. 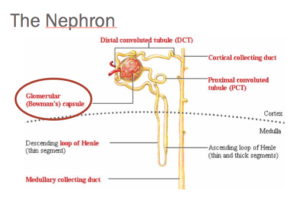 Each nephron is composed of two parts—a filter called a glomerulus and a tubule. 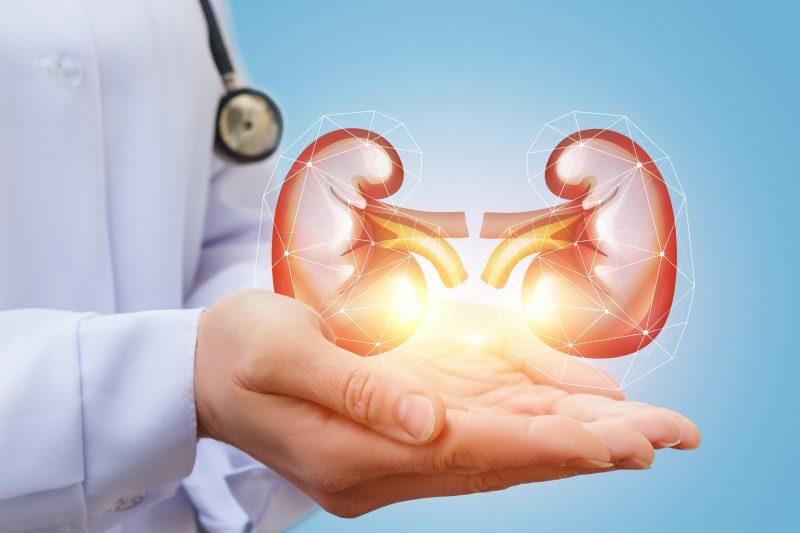 When the kidneys are damaged, this can lead to symptoms of swelling, shortness of breath, increased sleepiness and fatigue, bone pain, nausea, vomiting, and poor appetite with weight loss. Damage to the kidney can be acute (sudden) or chronic (lasting longer than 3 months). Acute damage can result from not enough blood flow to the kidney, direct damage to the kidney or urine backing up in the urinary system (otherwise known as obstruction). Over 660,000 are currently living with the diagnosis of End Stage Renal Disease. 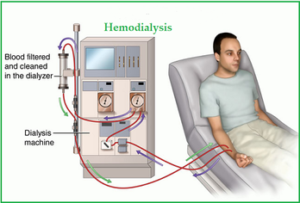 Of these approximately 467,000 individuals are on a life-saving mechanism called dialysis—renal replacement therapy. Of those, greater than 60,000 are doing dialysis at home. 100,000 people a year are waiting for a kidney transplant. Currently, 17,000 individuals a year receive a transplant (either living or deceased). Fewer than 10% of the population is aware they have kidney disease. Only 50% of people with stage 4 kidney disease (see below) are aware of their diagnosis. Only 30% of patients with a diagnosis of kidney disease have ever seen a Nephrologist (kidney doctor). Less than 50% of people with a diagnosis of kidney disease stage 3b or worse (see below) have seen a kidney doctor at least once. Women have a higher prevalence of kidney disease versus men, but men have higher mortality (death) rate at every stage (see below). Dialysis patients are 1% of the Medicare population, yet 8% of the cost. Cost of care increases every stage of kidney disease (see below) exponentially. Higher than 30 mg/gm = a possible sign of kidney disease. Diabetes: affects the glomerulus –leading to protein in the urine (causing leg and ankle swelling). 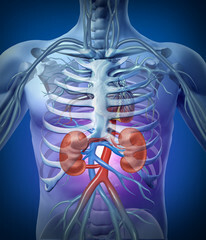 Kidney disease will occur and progress rapidly with poor sugar control, blood pressure control and family history. Type I diabetics will begin to see affects of kidney disease up to 5 years after diagnosis. With progression to severe kidney disease anywhere between 10-30 years later, depending on the level of control. Type II diabetics have a similar timeline, but occurring with diagnosis later in life. Hypertension affects the blood vessels and tubules in the kidney, preventing the elimination of fluid and waste. The buildup of fluid and waste causes more damage to the vessels, causing further waste buildup. This vicious cycle leads to progressive kidney failure. To prevent progression: aggressive blood pressure control, compliance with medications, exercise and LOW SALT DIET. Diseases that affect the glomerulus (Glomerular Diseases—Lupus, IgA, minimal change, HIV, Vascular diseases etc.) cause damage to the glomerulus resulting in protein and blood in the urine with high blood pressure:Treatment includes ace-I or angiotensin blockers for kidney protection/reduce protein in urine and blood pressure controlSteroids for diseases attacking the immune systemWater pill (diuretics) to help prevent swelling. To conclude kidney disease is a severe problem, with serious health and financial consequences. 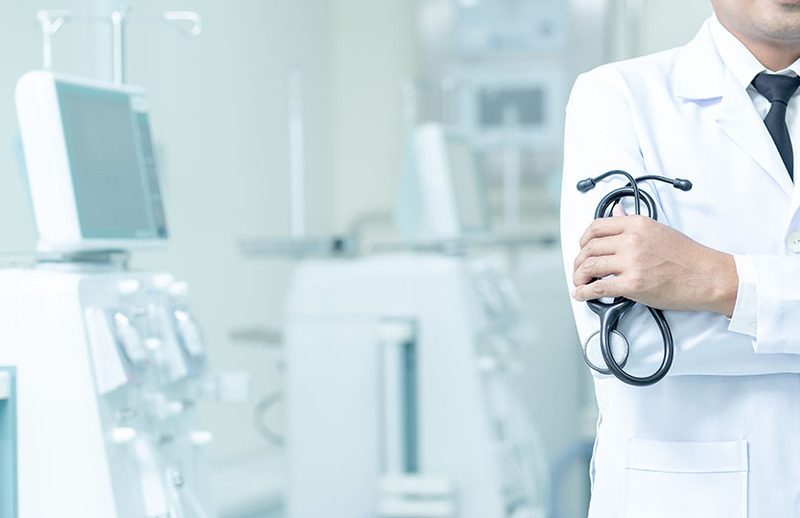 Early diagnosis and regular follow up and preventative treatment will greatly reduce the progression of this disease and the burden it places on patients, family members, the health care system and society.